Quite often these days, when applying to perform at a festival, hafla or show, you will be given a set of guidelines, including music length. This is not planned to upset the dancers, but to give everybody a fair chance and to avoid hogging the stage. The limits I’ve received most often have been between 3:30 and 4 minutes. Does this mean that we can only pick songs or musical pieces that are shorter than that? Easy answer would be yes, but true answer is… not necessarily. Enter music editing software. Audacity is a brilliant little program, free, which comes for Windows, OSX and Linux operative systems, so as long as you are using a desktop or laptop, you can use it. It’s available for download here: https://www.audacityteam.org/ A lot of people think that editing a song means just chopping off a beginning or an end, but this doesn’t have to be the only thing you do, and for dancing, this can be counterproductive, as it can leave you with a dull repetitive chorus, or remove a punchy end or a juicy beginning. Judicious editing allows you to create a new version of the track, keeping the bits you want, maintaining or even improving the original dynamics, and reassembling them, like a puzzle. Or adding pieces from another song. It’s kind of addictive and opens up a *lot* of possibilities. So, how do you use it? First things first: you are going to get better results if your original sound file(s) are encoded directly from the source (CD, vynil or original recording) as a looseless WAV. 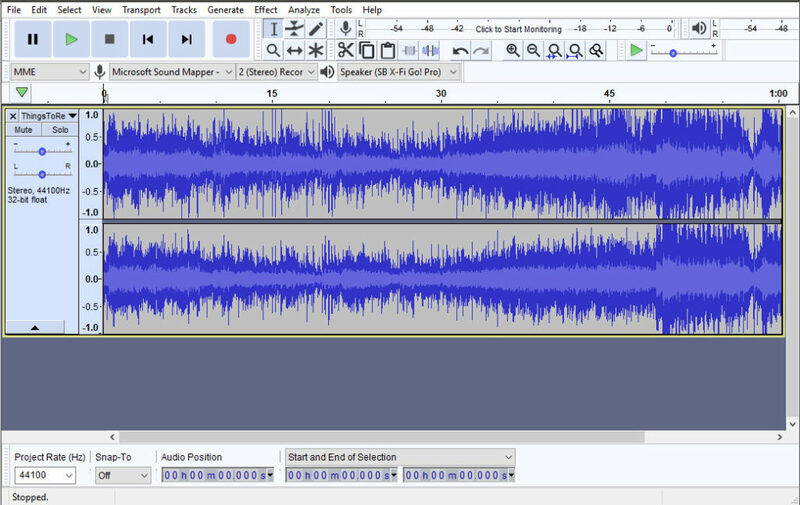 “Looseless” means there was no compression of the sound file aimed at reducing file size; this is usually not that noticeable, but when you are manipulating the files it produces lesser quality results in the end. So if you have a CD, re-encode the song as a WAV. If all you have is an mp3, try to obtain the highest quality possible from the original vendor or distributor (320 kbps if possible). Do not encode upwards, that is, don’t re-encode at 320kbps if you have it at 160kbps, and do not burn a cd and re-encode as a wav if all you have is an mp3. Basically, work from the highest quality file you’ve got. First, import the track via File=> Import=> Audio. Your song will load, and you will see the first “track” as two fields of squiggly lines (see image below). These are the left and right channels of your track. The blue spiky fields represent the sound waves and dynamics, which translate to our ear into sound quality, volume and intensity of the music (more instruments, more things happening, etc). The top playback controls should be easy enough. I’d recommend you play the track once in full, paying attention how the tracker (vertical line) moves along the track and noticing how what you hear is displayed graphically. Note whether there are particular sections that you want to keep, and bits that you would like to removed, either because they are repetitive, or because they are not adding anything to the song. If you can, note down where they are, using the “audio position” value at the bottom of the screen. Doing a basic Intro/Outro is the easiest way to get started, so let’s say we want to remove the first 20 seconds, and the last 10. First make sure there’s no playback going on, and none of the playback buttons are greyed out or in use; pause is still playback so you need to make sure to press STOP before attempting any editing. Use the selection tool (vertical line | in the top row, to the right of the red dot for RECORD) to select the first section we want gone. It will highlight; we can hear just that section using the playback controls. If it’s the selection you want removed, hit delete on your keyboard, making sure there’s a smidge of it left before the actual section of song you want to keep starts, unless there’s a very sharp cut (actual silence) in the track. Select this smidge now, and use Effect=> Fade In, to make this start less abrupt. Use the magnifying glasses tool to see the soundwaves in more detail. Do the same with the ending you want removed, select, delete, and this time use Fade Out to end the track more gradually. Export using the File=> Export=> Export as MP3 to save this new version. Or export as WAV if you want to burn it to a CD. This is all well and good, but what happens when you want more complex editing, and what do I mean by that? Example: this (plus a couple of seconds that are missing from the video) is a Type O Negative track that I danced at Belle, Book & Candle show with Princess Farhana in 2018 https://www.youtube.com/watch?v=6XgNH5lTRwY. The original track is 7:15 and you can listen to it here ; the single edit for the radio is 4:51. My editing took the song down to 3:39, and instead of chopping off the atmospheric intro or the mournful outro, I worked removing second verses, phrases and reducing length of solos to achieve the length I needed. 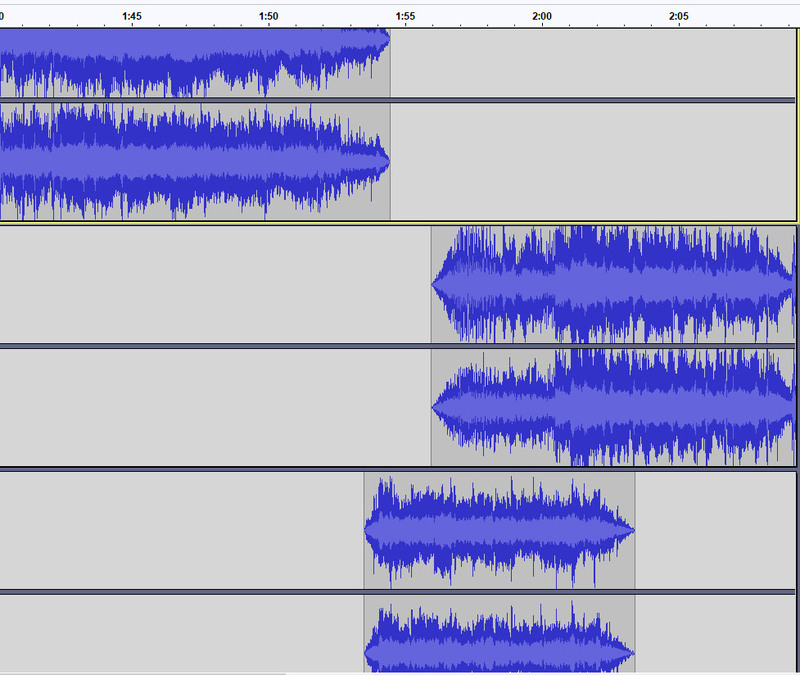 Comparing both tracks you can see that they keep similar dynamics, and all the sections from the original song are there; mine is just condensed. I basically cherrypicked what I considered the best moments of the song, and distilled them into a new version. So, how can you achieve a similar effect and keep it ? Like before, listen to the track, notice bits you want to keep and bits that can go. Find the first obvious place to make a cut, but instead of just deleting, cut from the place you want the cut, to the END of the song, create a new track (Tracks=> Add New=> Stereo) and paste the second part of the song in this new stereo track. You can use the “mute” and “solo” buttons on each track to listen to each part on their own, and since you wanted to remove a bit, you now have basically the scenario above of editing begining and/or ending. Therefore, the same procedure applies: select the bit you want gone, delete, fade in or out. Use the Time Shift Tool (the double ended arrow <-> ) to move the new section to the right (later) or left (earlier) so it starts as the previous section ends; the fades in and out of each section should make them blend. Lather, rinse, repeat. To avoid lag, I recommend working with no more than 4 stereo tracks at a time, but this might not be enough for complex edits. If you’ve got a beginning worked out and your computer is slow updating the viewport, export this beginning by muting the non-edited section, then using File=> Export=> Export as WAV. This will create a new file with everything into a single stereo track. Save this doc. Select the unedited section and copy, then close this document. Open a new document, import the track you created in the previous step, then create a new stereo track and copy the unedited section you copied from the previous doc; continue editing the last sections in the new doc. It will take some trial and error to find the best places for these edits, but some care will get you the best results. always match the actual tempo; for instance, don’t end one section on the 4 and start the next one on the 2 or it will feel jagged; if there is a slight difference -can happen in field recordings and ethnic music- use the Effect => Change Tempo tool to see if you can make the transition better. keep to the song’s basic structure as much as possible, so if your verses are 4 lines each, 8×4 counts, your editing doesn’t turn them into 3 lines, or 5x 4 counts. use the selection tool to listen to the joints in sections, but don’t be afraid to step back regularly to listen to all you’ve got so far, to make sure that it’s got the overall dynamics that you want. Most important, to me, try to keep the song’s flow; I know it’s quite common these days to have 4 bars of this song and 8 bars of another and 16 bars of something yet again different, and to my ear, quite often this feels disjointed. But this is your story to tell, just make sure that the editing doesn’t overshadow or distracts from your dancing. And that should be it. The process is laborious but not too difficult once you figure out how to do it; it does require attention to detail, but it will help you break free of pre-recorded music constraints. What about you? Do you feel like learning to edit your tracks, or would you rather work with tracks the way they were intended originally, regardless of length?